Polarity switches allow you to configure the tap tempo from Normal Open to Normal Close. Depending on your device, it will require one of these modes to function fully. Boss RC Loop Stations require Normal Close switches, while many delays can use Normal Open. A polarity switch will allow you to toggle between those modes. 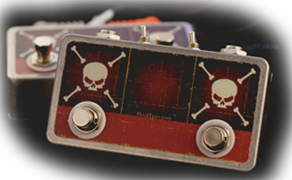 If you’re not 100% sure on which switch type is best for you – go with the Polarity Skull Tap. We offer a Polarity Double Skull Tap as well. For example a Double Skull Tap in normal close mode would work great for a Boss RC Loop Station, but let’s say you wanted to control a Loop Station AND a Boss DD-7 Delay, you would set one side to be Normal Close (Loop Station) and the other side to be Normal Open (DD-7).